Palmetto Bluff Wedding Photos show the casual Southern charm offered by the venue. Palmetto Bluff is an enchanting area of South Carolina. The location is known for its preserved natural beauty, maritime forests, and marshlands. Often Palmetto Bluff wedding ceremonies and receptions are held outdoors, but weather and other factors can encourage a couple to move the festivities inside. 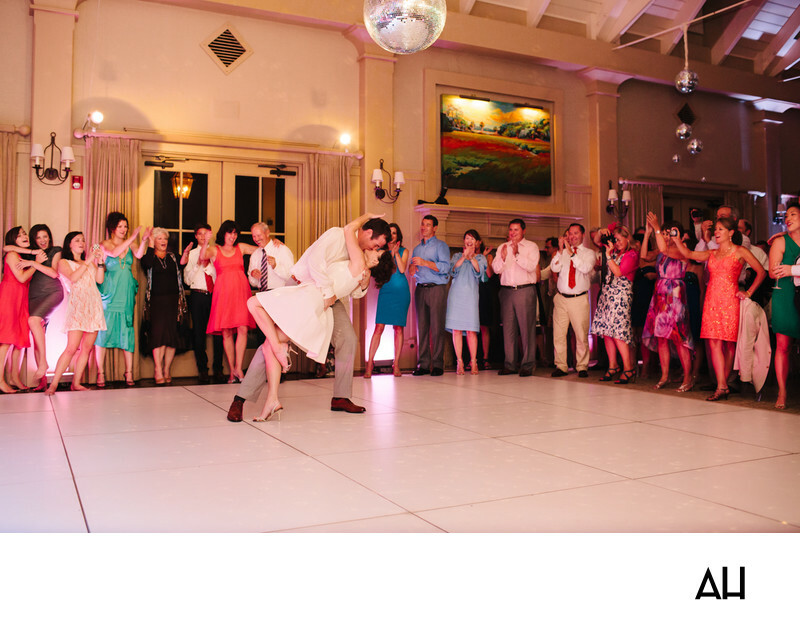 In this image, guests cheer the newlyweds on as they celebrate on the dance floor. The guests wear bold colors, from wild orange, to vibrant teal, to bright blue. Their outfits and expressions add life to an otherwise plain room. The ballroom is not lavish, but that is not an issue when taking Palmetto Bluff Wedding Photos because the energy that fills the space is so intoxicating. The room is spacious and perfect for the merrimaking that comes with a joyful wedding reception. In the picture above, the groom dips his bride back for a dramatic kiss underneath the disco ball. The silver ball spins above the bride and groom, casting shadows on the walls as it moves. The bride lifts one heel up as she wraps her arms around her new husband, and the two look like an old picture of a couple reuniting in the 1950s. The bride has changed into a shorter, simpler white dress for the reception. This allows her to spin, twist, and move to her heart’s content with the love of her life. The ballroom dance floor is wide open and awaiting the guests to join the couple in their revelry.